After a meeting with Volkswagen at the Grand Hyatt in Mumbai, we conferred where to eat lunch, at the Delicatessen called the Gourmet Store ? ( that’s as far as I would go in a large hotel, even the coffee shops are unaffordable). The Gourmet store is a true Delicatessen or Deli, where you can buy, Cured meats , Cheese, Foie Gras, Pate, Breads, Besides they do some gourmet sandwiches with choice of bread like focacia, stuffing’s like ham, cheese , jalapenos. With a choice of plain, toasted or grilled. I like the place. Besides, very few places in India can claim to be true blue delicatessens. Especially, the likes of Indigo Deli in Mumbai and the Smoke House Deli in New Delhi are far from being a that. They turn out to be fully fledged restaurants and masquerading to fine dining in that. True to my s alt and grain we decided, to get going from the five star environs, after gulping a few more lungs full of air conditioned deodorized hotel air. Headed to Worli, in a lane opposite the old passport office, to Hotel Matruchaya, the perfect salesman’s eating out experience. We stick to the Non Ac hall to recheck our recently debunked theory of service and their relationship to AC halls and Non AC Halls. Yes In Mumbai you still get better service in the Non AC Hall. We enter a nd stick to basics, though my colleague Shiny, politely mentions something Tawa, (for a person in Mumbai, anything done on a Tawa is something special), we stay away from anything on Tawa. It’s a grubby two level restaurant, with quick service and almost ready made food. We order, aVegetarian Meal/ Thali for the Vegan Ankeet . A Prawn Masala Thali and a Mutton Masala Thali and as add ons we order a Surmai Fry (Seer/ King Fish)and Bombil Fry (Bombay Duck a Fish), a Prawn fry, A dish of Vade (fried, hard Malvani Puris) and Two Jeera drinks. around this range. Almost feels it comes out of a common kitchen located centrally, only garnished on site. We have this entire gourmet meal for Rs 355/, about Rs 118 per head, we just crossed the Rs 100 mark. But, like I have said before, we make a subliminal effort and not a conscious effort to stay under the Rs 100 mark. 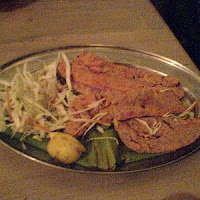 Matruchaya, is for the hard worker, a thirty year restaurant, run by Prashant Bhingarde and his father Prakash Bhingarde. Simple food, simple ingredients, at simple affordable prices for the blue blooded proletariat. The Blue collared worker, the true Mumbaikar, or a blue collared masquerading as a white collared (photo enclosed, Both Blue and White Collared). This place was recommended by my friend and ex colleague, Sanjay Das….. An eternal foodie. Thanks Sanjay, enjoyed the experience. Cannot wait to all the new exotic places you have lined up in Calcutta specifically Chitta Da.